Wave breaking is an intriguing hydrodynamic phenomenon that is familiar with many people, such as surfing waves and tsunami. Upon breaking, a wave front often breaks into tons of fine droplets and appears to be white. However, imagine when the wave itself is as large as a single droplet, how does its breaking look like? 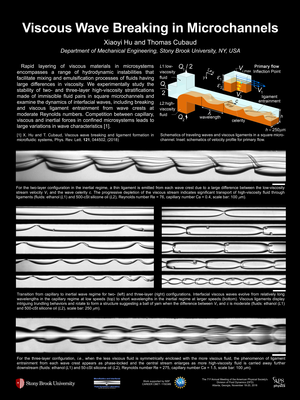 In this poster, we explore interfacial wave breaking at the microscale by observing waves made between ethanol and highly viscous liquid in a microchannel. A brand new type of wave breaking phenomenon is unveiled: each broken wave crest emits a thin ligament that can be rotated and stretched downstream. Understanding viscous wave breaking at the microscale could inspire new material synthesis technology, or simply serve as the guide line to build a “waterpark” for ants.